Seven-year-old Elsie is a Chihuahua at the Champaign County Animal Welfare League, where she is learning to accept kindness. Wanted: A loving person who will offer more kindness. Since he’s black and white, “Domino” is the perfect name for this feline, who is waiting at PAWS Animal Shelter for his purr-fect owner. Sweet Cleo is a 3-month-old pointer mix ready to be adopted at PAWS Animal Shelter. Red is a 7-month-old boy who’s ready to celebrate the season in a new home. Check him out at Barely Used Pets. 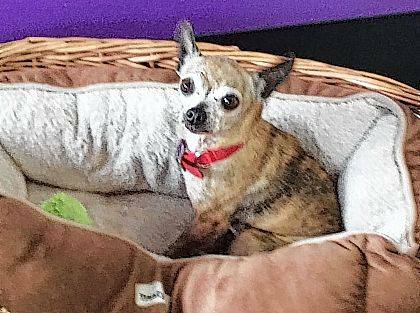 Chihuahua lovers, Champaign County Animal Welfare League would like to announce “Elsie” as “pet of the week.” She’s a 6-pound, 7-year-old Chihuahua and is waiting for her first forever home. Elsie came to us from an Amish puppy mill, which means she’s never been in a real home with the love and caring hands that she deserves. Because puppy mill dogs are not handled, Elsie is learning that being touched is a good thing. She would love to be adopted by a patient, caring owner who can help her learn to love and to be loved. She gets along great with other dogs and is cat friendly. One of her favorite things to do is to snuggle in a dog bed and to wag her little tail when people approach her. This cutie pie is wanting to spend the holidays with YOU! The David Robert Wetzell Memorial Clinic is offering a Low Cost Spay and Neuter for cats and dogs. Interested people must come in and fill out the necessary paper work and pre-pay for the surgery. At that time, a scheduled surgery date will be selected. Having feral cat issues? We offer TNR’s (trap, neuter, return) as low as $30.00! Please feel free to call us for more information about our low-cost sterilizations at 937-834-5236. Our winter hours are Wednesday through Saturday, noon-6 p.m.Looking for a place to volunteer? Come by our facility and pick up a volunteer application. We would love for you to be a part of our caring team. Also, don’t forget memberships are still open! A CCAWL membership includes the use of an indoor/outdoor dog park, grooming facilities, as well as the trails and agility courses. We are located on 3858 State Route 56 Mechanicsburg. Need a friend? Domino is a terrific cat looking for a good forever home. His black and white coloring really stands out, making him a very handsome boy. Domino has a great personality and loves to play. He enjoys all sorts of kitty toys and napping in the cat tower. If you are looking for a faithful companion then Domino is just the one. He is a quiet and mellow cat who likes attention. Domino is good with other cats and loves people. He is up to date on his shots and is neutered. Domino tested negative for feline leukemia and he is litter box trained. Please give Domino a chance to be your pal. Look at that puppy face. What a sweet girl! 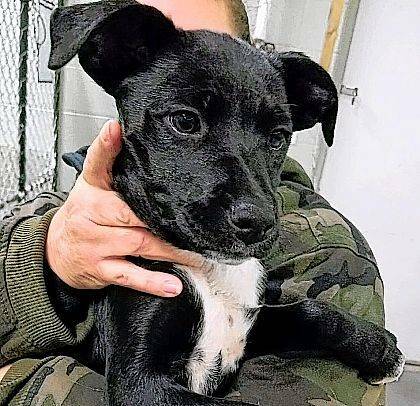 Meet Cleo, a 3-month-old pointer mix little girl who loves everyone. Cleo is just a bundle of joy, and she would be an excellent choice as a new family member. She is content to sit on your lap or join you on your daily jog. Cleo is up to date on her vaccines and ready for your family. Come out and meet Cleo. Hi, I’m Red! I’m a 7-month-old Heeler mix boy. I’ve completely mastered the “puppy eyes” look. I am great with dogs and kids, but because I’m a Heeler kid, probably not good for me to be around cats. They say it appears that I’m house trained. I promise to do my best if you take me home. I’m really excited to find my forever home and love my owner as much as they love me! Please come and see me and we can run around on the playground! https://www.burgtelegram.com/wp-content/uploads/sites/17/2017/12/web1_LeagueDogWeb.jpegSeven-year-old Elsie is a Chihuahua at the Champaign County Animal Welfare League, where she is learning to accept kindness. Wanted: A loving person who will offer more kindness. 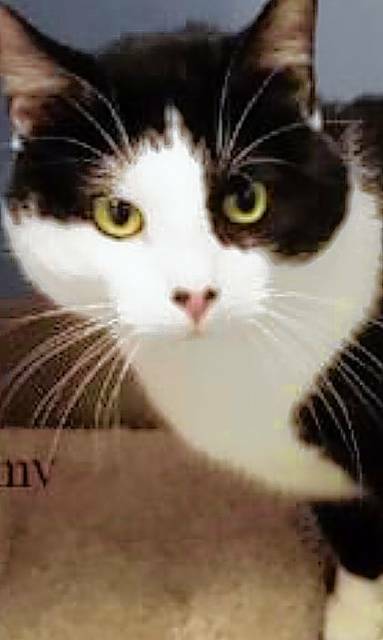 https://www.burgtelegram.com/wp-content/uploads/sites/17/2017/12/web1_PawsCatWeb.jpgSince he’s black and white, “Domino” is the perfect name for this feline, who is waiting at PAWS Animal Shelter for his purr-fect owner. https://www.burgtelegram.com/wp-content/uploads/sites/17/2017/12/web1_PawsDogWeb.jpgSweet Cleo is a 3-month-old pointer mix ready to be adopted at PAWS Animal Shelter. 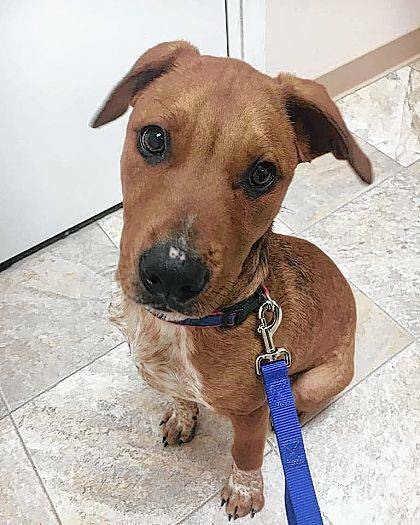 https://www.burgtelegram.com/wp-content/uploads/sites/17/2017/12/web1_RedWeb.jpgRed is a 7-month-old boy who’s ready to celebrate the season in a new home. Check him out at Barely Used Pets.